Major George Camp commissioned this chapel for the wedding of his daughter "Miss Lou" to Henry E. Wedelstaedt and dedicated it to the memory of her three deceased siblings. 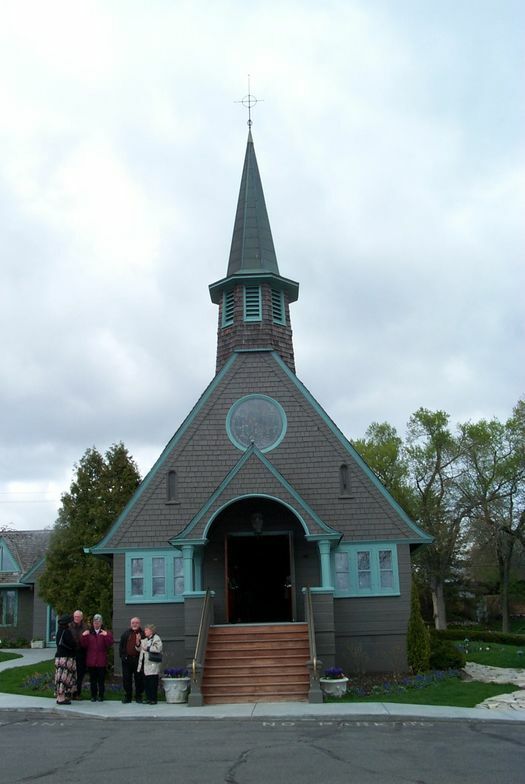 Built of wood with an unfinished interior, the Camp Memorial Chapel is loosely modeled after the Virginia Street Church in Saint Paul (1886) and uses a similar tower. Like the Virginia Street Church, the building is small in scale. [Several years after its construction, Bishop Henry Whipple forwarded a letter to Gilbert from a man in Hope, Arkansas. The man, whose name is illegible on the letter, asked for building plans so he could construct an identical church in his community. Episcopal Diocese to CG, June 24, 1895, Box 17, Fldr. 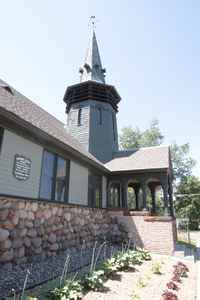 : General Correspondence, 1895, MNHS-CGP] After the wedding, the chapel was donated to the Episcopal Diocese and used for many years as a summer chapel. After World War II the building was moved several hundred feet from its original location to its present site next door to Camp's summer house. 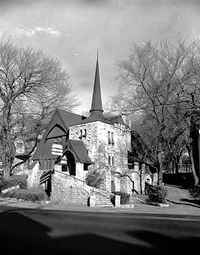 The interior was finished, the building winterized, and the church renamed St. Martin's-by-the-Lake Episcopal Church. It was unusual for a Minneapolis man such as Major Camp to hire a Saint Paul architect, and Camp's own Minnetonka Beach house—near the landing where James J. Hill's largest-ever boat on the lake docked—was built around the same time but it was not the work of Gilbert & Taylor. Although Gilbert & Taylor had designed two summer cottages in the neighborhood during the previous year for the Fuller and Pineo families, it is likely that the Wedelstaedts influenced Camp's choice of architects to design his chapel, for Gilbert is known to have designed at least two projects for them, a Summit Avenue house and a retail store interior. Also, Major Camp hired a Gilbert & Taylor competitor, Reed & Stem, to design a house for his daughter and son-in-law at 517 Holly Avenue in 1891. Stem owned cottages on both Lake Minnetonka and White Bear Lake, and his presence on Minnetonka was likely his connection to Camp.